A hallmark of startup growth is when it moves from the business owner’s basement to an office. It was fledgling companies such as these, now called startups, that were among the first to explore shared office space as an alternative to relatively expensive traditional office space. Since, many others – freelancers, professionals, and even Fortune 500 companies — have also opted for shared office space and flexible workspace in its many forms. Here the author details the options for shared office space and flex space, including coworking and semi-private office space, as well as the option of business centers. He also discusses the pros and cons of each alternative office space. We’ve all heard that “practice makes perfect.” But when it comes to mastering a new skill, Johns Hopkins researchers have discovered that more important than how much you practice is the way you practice. Why? The scientific answer is “reconsolidation, a process where existing memories are modified with new knowledge.” Here the author discusses how to accelerate the time it takes to learn a new skill, allowing time for your memory to consolidate it and then practicing it differently. It’s a well-established fact that a large majority of both senior managers and employees consider meetings unproductive and inefficient, if not a pointless waste of time. If you’ve tried switching up your agenda with every possible format and still find your meetings are unproductive, the author suggests “rethinking you physical meeting space and layout.” He then discusses five ideas that you might want to try to make your meetings more productive, from ditching the standard table-and-chairs setup to encouraging your colleagues and employees to get up and move around. Entrepreneur-minded people looking to start their own business, take note of this comprehensive guide. It begins with researching the business that most suits you, including market research of potential customers and competitors. The author then discusses all the steps you need to take for starting your own business, from creating business and marketing plans to determining its legal structure and acquiring liability insurance. In this well-considered article, the author addresses what constitutes an effective sales strategy and five reasons why your startup needs to focus on sales: it maintains the cashflow of your business; serves as an interface between your business and customers; determines the success of scaling your business; helps address the needs of customers; and finally, brings more investors. Subscription box companies and related services are among the fastest-growing companies in the U.S. that rank on the Inc. 5000. With big brands such as Target and Walmart entering the subscription box market, the primary challenge for all businesses in this vertical is to distinguish themselves from Amazon. Entrepreneurs should not be discouraged, however, as “there are some very small players who are uncovering various niches,” according to the global knowledge management director for a specialist growth consulting firm based in New York. He continues, “The most successful companies are those that apply careful market research to solve customers’ problems.” With that, here are the three fast-growing subscription companies included in the Inc. 5000 this year. While you know you need to always be learning something new to be a successful entrepreneur, you may not know that there are several free online classes from top universities worldwide to help you sharpen and fortify your leadership and business skills. Here are ten of the newest ones available, from Harvard University’s “Improving Your Business Through a Culture of Health” to “Agile Leadership Principles” from University System of Maryland. Optimizing productivity, especially when operating on a tight budget, is something all startups seek to do. Although some founders may think that bringing on new staff will jumpstart their company’s growth, it actually can have the opposite effect. Another route is to stay as streamlined as possible financially, and optimize processes and workflow (rather than overworking your current staff). Here the author discusses four ways to avoid over-hiring: hiring those with a versatile skillset at the outset, automating everything you possibly can, outsourcing work, and setting up a solid internship program. “The Canadian startup scene is ready to perform on the global stage — but, according to two of Canada’s most active investors, it’s in need of a pep talk,” the author begins. 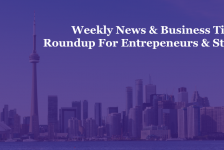 “Both Bruce Croxon and Anthony Lacavera argue that Canadian startups have incredible potential yet often exit early or sell out to large foreign companies. They feel like (and I would agree) overcoming this mentality and trying to cultivate companies from within will transform Canada into a 21st-century economic powerhouse.” He continues by saying “Too often, founders race toward an exit strategy instead of building scalable, sustainable companies.” While VCs can help in overcoming a startup’s initial challenges, “to write real success stories, alternative funding is often essential.” In this detailed article, learn what your options are to benefit your company in the long term.